A large percentage of the fertility clients I see have been prescribed thyroid medication as part of their preconception care. Fertility doctors know that the thyroid is a critical hormone for conception and pregnancy and that the “fertile” range is much narrower than the “normal” range. When I am doing a workup with someone, I consider low thyroid a blinking signpost, a symptom pointing to an underlying problem. a diet lacking iodine and selenium – iodine is essential for the production of thyroid hormone. Selenium is required in the thyroid for it’s antioxidant function and for metabolizing thyroid hormone. Natural food sources of iodine include dairy products, eggs, seafood and seaweed. Selenium can be found in many of the same foods as well as nuts and seeds. Nature is amazing in pairing useful nutrients together in the same whole foods! chlorinated water “hotboxing” our showers – Our water supply is disinfected using chlorine. And while our bodies can filter much of the chlorine from our drinking water, the chlorine in the steam of our showers gets inhaled into our lungs and is absorbed directly into the blood stream. Chlorine is similar enough to iodine that your thyroid will absorb and store it in place of iodine, effectively “displacing” iodine. years of yo-yo and starvation diets – calorie restriction reduces your metabolic rate (it’s a survival mechanism! ), but one of the things that is not well known is that when a low calorie diet is abandoned, the metabolic rate is slow to recover. This often causes people to regain weight lost and gain a little more. Repeated cycles of this metabolic manipulation can cause changes. adrenal burnout / chronic stress – all hormone systems are linked in a web of activity. Changes in one hormonal system affect all of the others. The adrenal and thyroid glands are intimately connected – when your stress response system is chronically activated, it tells your thyroid to slow down to conserve energy. 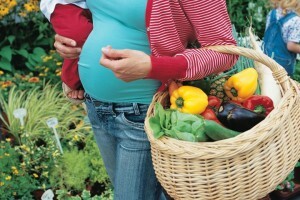 A healthy thyroid is an essential part of improving fertility and supporting a healthy pregnancy. Take care of yours so it can support your good health!